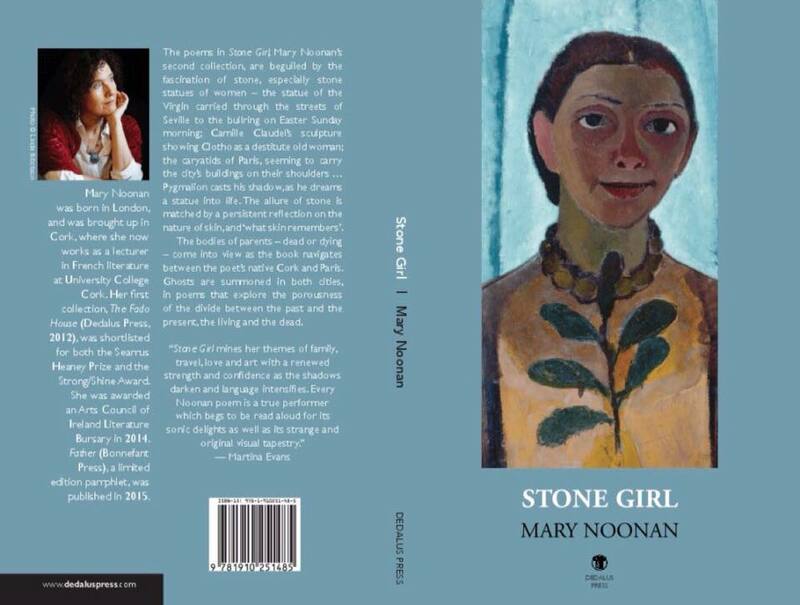 Congratulations to our wonderful colleague Mary Noonan from the French Department at UCC on the publication of her latest poetry book, Stone Girl. The poems in Stone Girl, Mary Noonan’s second collection, are beguiled by the fascination of stone, especially stone statues of women – the statue of the Virgin carried through the streets of Seville to the bullring on Easter Sunday morning; Camille Claudel’s sculpture showing Clotho as a destitute old woman; the caryatids of Paris, seeming to carry the city’s buildings on their shoulders…Pygmalion casts his shadow, as he dreams a statue into life. The allure of stone is matched by a persistent reflection on the nature of skin, and ‘what skin remembers’. The bodies of parents – dead or dying – come into view as the book navigates between the poet’s native Cork and Paris. Ghosts are summoned in both cities, in poems that explore the porousness of the divide between the past and the present, the living and the dead. Find more information about the book on Dedalus Press’ website.